Ever had a “burrito in a bowl” instead of a wrap? Well, this is the Egg Roll version! It’s an awesome way to keep this delicious meal low carb but still keep the yummy factor! 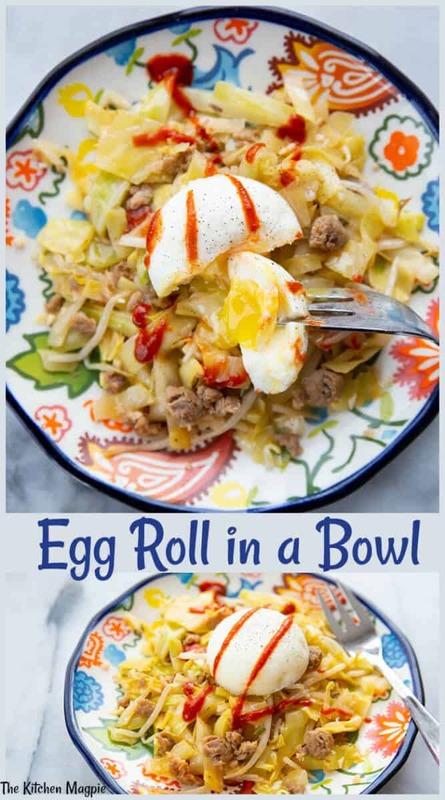 Egg Roll in a Bowl is also the perfect lunch or dinner to get read if you’re stuck for time. This is a great replacement for traditional egg rolls and it’s a super tasty option that’s perfect for anyone following a keto-friendly diet. Anyway, isn’t the filling everyone’s favourite part of an egg roll in the first place?! The clue is in the name! Taking the wrap out of the equation makes this a super healthy option that’s suitable for a range of diets. 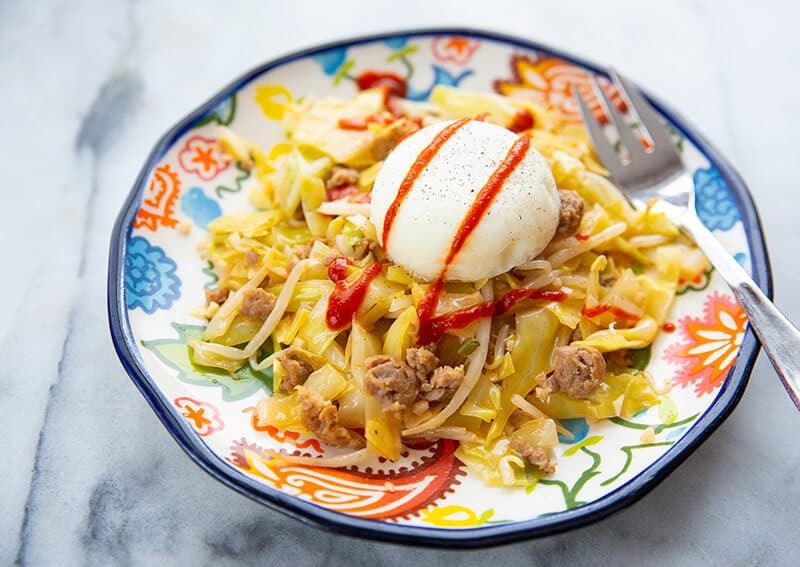 In terms of cooking, it’s very similar to a ground pork and green cabbage stir-fry, so it’s definitely a LOT easier to whip up than it sounds! And on the taste front, it’s just like a normal egg roll minus the deep-fried wrapper. In a large skillet, fry the ground pork until cooked and no longer pink. Drain and return to the stove. Push the ground beef to the side and add the sesame seed oil in the space. Heat the oil then add in the ginger and garlic and fry for 2-3 minutes, then mix into the ground pork. Add in the coleslaw mix and bean sprouts. Drizzle with white vinegar, soy sauce and sprinkle with the sugar, salt and pepper. Fry for another 5 minutes until the cabbage is wilted to your liking. Plate, then sprinkle with the toasted sesame seed and green onions. What goes with Egg Roll in a Bowl? 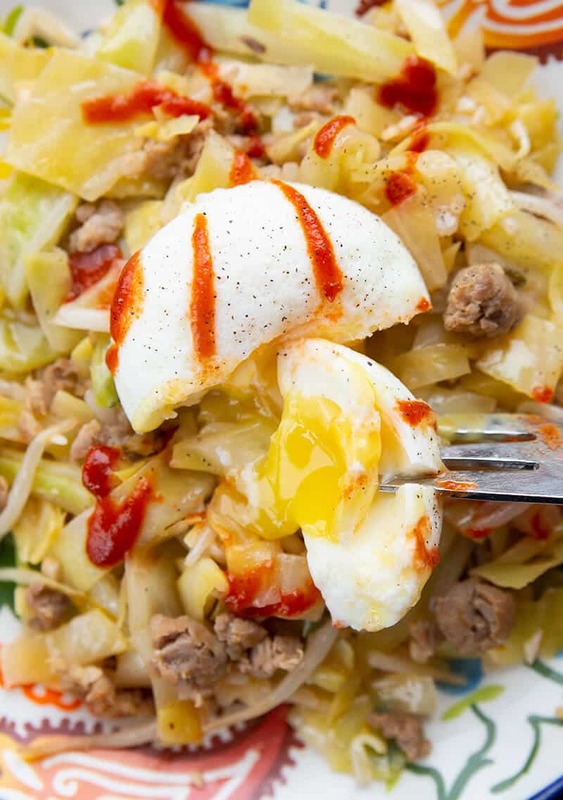 Egg Roll in a Bowl is so filling that you really could just serve it on its own if you like. But there are also some great side serving options you can try out. For a low-carb version, I like to add some cauliflower rice when serving. If you haven’t tried it out yet, I definitely recommend giving it a go! How to Add Some Variation to Egg Roll in a Bowl! There’s no rulebook that says you have to use ground beef and pork for this recipe, so why not try ground turkey instead if you want to mix it up a bit? Opting for ground turkey will make it a little bit healthier/leaner. But ultimately this is a pretty healthy dietary option regardless! What are the Health Benefits of Egg Roll in a Bowl? This is basically one big bowl of goodness! Cabbage is a cruciferous vegetable and you probably remember from school that this type of veg is really beneficial to your overall health. Cruciferous vegetables are full of vitamins, folic acid, iron, and other important minerals! Ground pork and beef are also packed with essential vitamins, minerals, and amino acids. Also, let’s not forget how easy this dish is to put together, which means less stress overall. Something that’s just as important in terms of health benefits! How Long do Egg Roll in a Bowl Leftovers Last? Your Egg Roll in a Bowl will last for 4-5 days when it’s properly stored in the refrigerator. But to be honest, it’s so easy to cook that you’ll probably just cook enough for one meal at a time (or, if you’re like me, end up eating it all in one go because it’s so yum!). Fully Loaded Cauliflower Garlic “Bread”: If you’ve never heard of Cauliflower Bread until now, you’ve been missing out! This delicious bread is wheat free, low carb, and a great way to add some extra veg into your diet! Slow Cooker Calico Beans Recipe: a super easy to prepare dish that the whole family will love. And it’s easy on the wallet too! 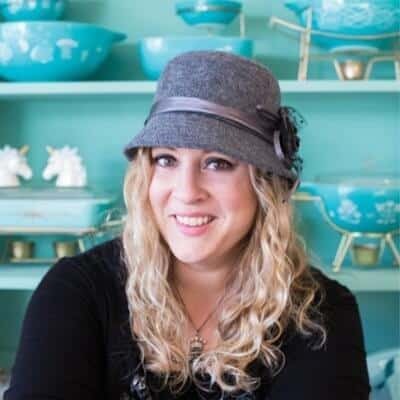 Ham and Mushroom Crustless Quiche: this quick and easy dish can be served hot or cold for brekkie or dinner, so it’s a must for your family cookbook! 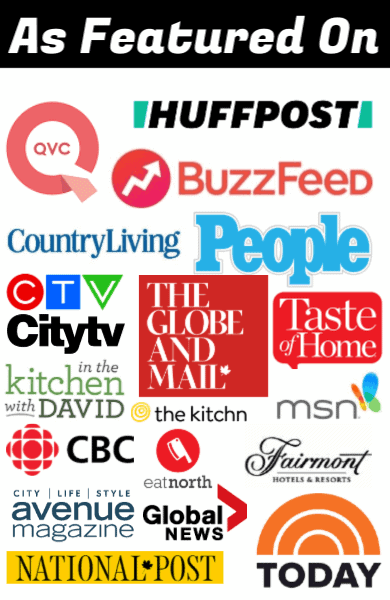 PIN THIS RECIPE to your DINNER OR BREAKFAST RECIPES Boards and Remember to FOLLOW ME ON PINTEREST! This egg roll in a bowl recipe is basically egg roll filling without the wrapper. While similar to crack slaw, this recipe uses ground pork and bean sprouts for a real egg roll taste! n a large skillet, fry the ground pork until cooked and no longer pink. Drain and return to the stove. 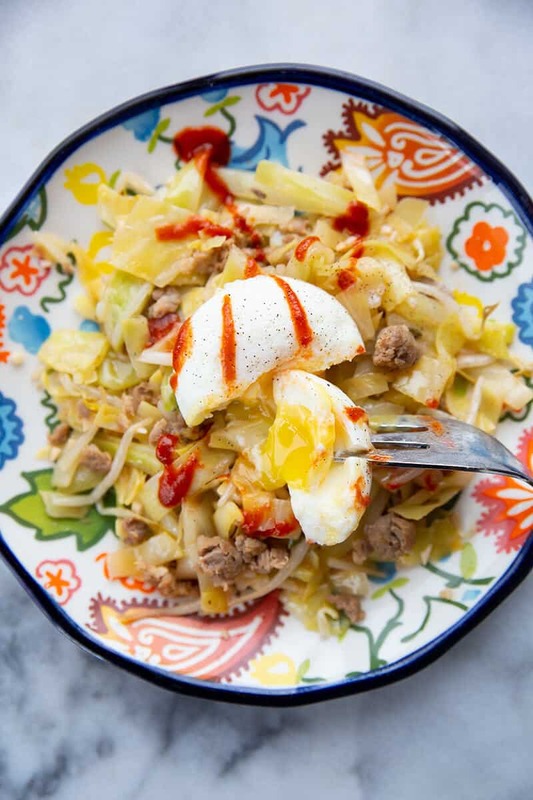 We like to top our egg roll in a bowl with a poached egg for extra protein!